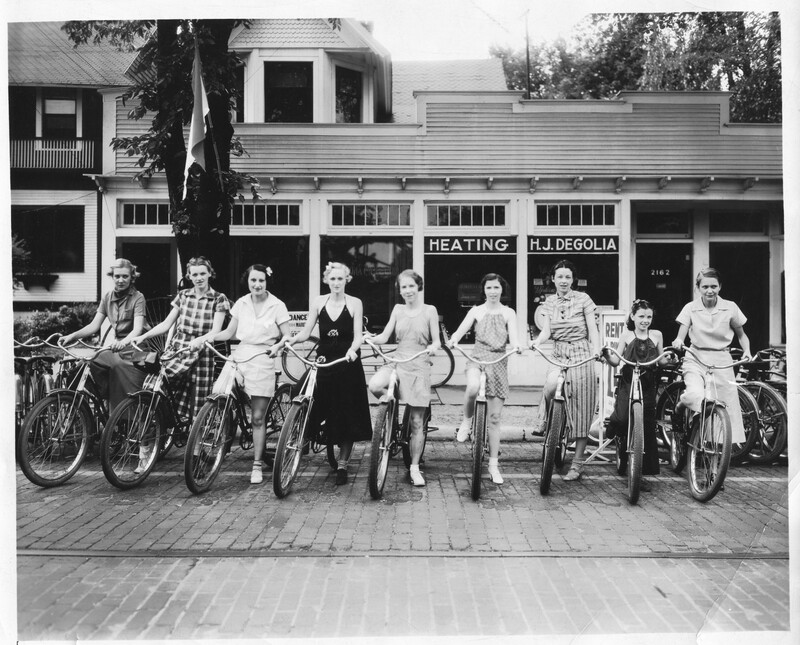 Eight women and one young girl pose with their bicycles on Wealthy St. in the shopping area of East Grand Rapids now known as Gaslight Village. They are from left to right: Miss Marion Serum, Mrs. D. Alden Thompson, Mrs. Robert Fortier, Mrs. Elmer Briggs, Miss Sallie Gillard, Mrs. Steketee Horning, Mrs. Jean Weldon (daughter of George W. Welsh, candidate for mayor), Miss Shirlie Weldon (daughter of Jean), and Mrs. Frank Matheson. A rail from the streetcar line can be seen in the brick paving. George W. Welsh, former alderman from the 11th ward, state representative from the 1st district, speaker of the house, Lt. Governor, and Grand Rapids City Manager, ran for governor in the Democratic primary in 1936. From 1938 to 1949 he was the mayor of Grand Rapids.